Happy Friday morning! I guess it's true that the squeaky wheel gets the grease because my internet is now faster than yours. I only had to call them five times before they sent a live person over, and he did a great job. If internet service was tennis shoes, I would say "Look at my new shoes! Watch how fast they make me run," and then I would do a lap around the living room. With my technical difficulties, I haven't shared any pics of our camping trip; therefore my list this week shall pertain to our woodsy adventure. I am the mom who went shopping at 10 p.m. the night before a camping trip and bought already-assembled bikes at Walmart. I also brought along my oldest son and let him ride his new bike through the store while I gathered the rest of my groceries. They're okay with that kind of thing at Walmart. Rowan was pretty stoked to get his new Spiderman bike and helmet. There's still a plastic thingy on the front of the helmet from where I ripped off the tag. All you type-A's who threatened to chase me down with scissors for leaving the thingy on my shoe are welcome to come over and remove it any time. Getting out of town is always the hardest part of camping for us. It seems to take for-ev-er to pack everyone up and finally drive away. This time we managed to only leave an hour behind schedule. We then drove five minutes from home to the sporting goods store where I wanted to buy an outdoor rug/foot mat thingy. They did not have such a contraption (silly me for expecting the camping store to carry something like that) but instead of just walking out empty handed, I bought a $40 percolator. I guess because it just felt wrong to leave a store without buying something. Jarrod had an old point-and-shoot camera in his truck and he told Haydn he could use it, so Haydn spent the entire 2.5-hour drive shooting pictures of the family sitting in the truck. I was starting to get excited because I was envisioning training this little man to be the backup family photographer, but after taking 30+ pictures, most of which were great, Haydn abruptly announced that he was starting over. He deleted every single photo before I could stop him. Someday he can tell his children about his brief stint as a paparazzo and how he got fired. After we finally made it to the campground (hurray!) my boys were given one simple instruction: "Do not jump in that gigantic puddle down the street, you only have one pair of shoes for the whole weekend." I suppose it was partially my fault, because what kind of mother only brings one pair of shoes to a soggy wet campground, but guess how long it took before we had to set up a make-shift drying rack and hope that we didn't lose one in the fire pit? Here's a hint~ not very long. We went camping with some friends of ours and she sent me this picture after we got home. I was glad I saw this after the fact because nobody told me that my child was touching raw fish. I don't think I even washed his hands that whole weekend. Speaking of lovely, check out these glamorous shots my friend Selina and I took of eachother on the camping trip. Nice, right? We thought it would be a good idea for us to start taking pictures of eachother since nobody else ever does. After seeing those pics, I'm not so sure it was such a great idea. Selina's shampoo-commercial-hair-blowing-in-the-wind picture does give me the giggles though. Wanna see it again? Oh man, she's gonna kill me. When we started out taking the pictures, I was just hoping to avoid a significant double chin, but Selina had grander plans. She wanted to learn how to capture a 'sun flare.' You know, those little floaty globs of light you see in certain photos? Before she finally managed to wrangle herself a sun flare like this. To get that shot we had to track down someone with an iPad and wireless service in the middle of the woods so we could look up a tutorial on the internet. She's tenacious, my friend Selina. Here's a funny story for you. When Haydn was playing baseball last month, one of the boys on his team had a younger brother just Greyson's age. They played together at every game and when the season was over Greyson cried because he would never, ever see his best friend again. When we got to the campground (two and a half hours away, remember) guess who was parked right next to us? What are the chances of that?! It was like Christmas in July... er, June. Rowan's BFF, Kaelah, was also camping with us. She and Rowan spent the weekend learning to ride bikes together and practicing their martial arts. Selina told me Kaelah came home giving everyone fist bumps and doing karate moves. I have no idea where she picked that up. Jarrod wasn't left out of all the bike-riding fun either. I borrowed a bike from a friend of mine (because J took the perfectly good bike I'd had since fifth grade to the dump) and Jarrod pretended to be offended by the fact that it was a girl's bike. He would ride it around the campground, calling out a disclaimer to everyone he approached, "Don't worry, this isn't my bike. I know it's a girl's bike. We just borrowed it." By the end of the weekend, though, I think he was actually kind of attached to that girly bike. Okay, I'm going to consider that Part I of the camping roundup because I have to edit the rest of my pictures and I'm getting bleary eyed. More tomorrow. You guys have been so awesome to come and link up with me over the last few months. Last week there were TEN of you 'fessing up! 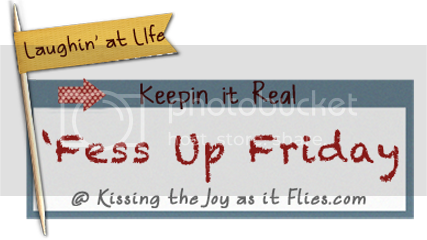 If you have time, make sure and click through some of the other 'Fess Up Friday posts that are linked. They are hilarious and you will probably find some kindred spirits. You guys make my day~ thanks for playing along! I LOVE your pictures!!!! You should link up directions for that sun photo deal, unless it's hard. . . then don't link it because I won't do it! Ha! I love the sunflare photos...and the dramatic-ness of eyes closed walking! (Are you wearing mascara while camping??) Totally unfair if your eyelashes are that dark and long normally. Thanks for the smile this morning! *snort* No, my eyelashes are NOT long or dark all on their own, but thank you for thinking so. I guess that should have been on my 'fess up list~ I wear mascara while I'm camping! I am still laughing! I can't even begin to decide what was funnier on this post! ONE pair of shoes camping??? Mascara? Hunting down a random stranger for sun spot pic info while CAMPING? I adore reading your posts, you make me keep my eye on the "sun spots" in my life and remind me to keep it real and laugh along the way. I don't finish a single one of your blogs without being grateful that God made you - just the way you are! Yeah, that was beyond disgusting. But you know what is even more disgusting? That it was just sitting on your picnic table. I think my favorite is Grayson's face upon realizing that his friend Cameron still exists! you're such a brave mama to go camping with your whole crew! i have very fond memories of camping as a child, but it really is a lot of work, isn't it? we had our maiden camping trip 2 summers ago when eli was not yet walking. what a MESS he was constantly. i was prepared with several changes of clothing. it was exhausting too because he woke up with the sun at just after 5am. while the rest of our group continued to sleep, i was just out walking him around the campground in the stroller. This made me think of our days of family camping...I have lots of stories and intend to save them to my blog one of these days. Sounds like lots of fun and happy memory making!